National Philanthropy Day® acknowledges the entire spectrum of services provided by the Hampton Roads nonprofit community and recognizes the profound impact that philanthropy has on the fabric of our society. 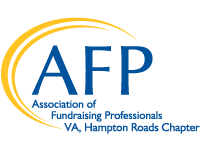 Each year the Association of Fundraising Professionals (AFP) honors individuals, groups, organizations and businesses who, through their hard work and dedication, have enhanced philanthropy, their communities and the world. Please plan to join us as we celebrate the region’s individuals, nonprofits, volunteers, businesses, and fundraising professionals whose philanthropic contributions are the foundation of our community. More than 500 senior business executives, philanthropists, professional fundraisers, volunteers and many others will gather to celebrate the 2018 National Philanthropy Day® Luncheon. This event offers community wide visibility and public recognition of individuals, companies, and foundations committed to philanthropy. Through their passion, dedication, and leadership, these outstanding leaders are improving the quality life in Hampton Roads, and are making the world a better place for all. If you are interested in a sponsorship, please click here for details on sponsorship packages or contact Ashley Gentry, National Philanthropy Day Chair.